Royal Chef 4 in 1 Drum Slicer & Shredder is a simple to use kitchen tool to help you prepare food quickly and in various styles hassle-free. 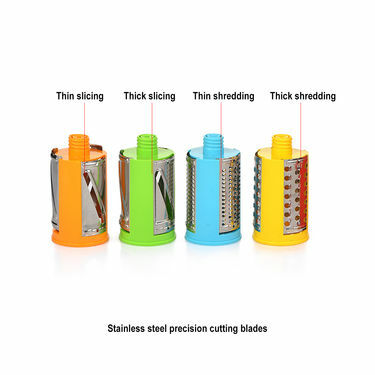 The interchangeable 4 in 1 stainless steel blades are ideal for thin & thick slicing and thin & thick shredding. It is robust & durable and can be mounted to any clean & non-porous surface with absolute ease due to its powerful suction base. All pieces are detachable for hassle-free cleaning and maintain. Whether you're preparing a feast far in advance or whipping up a quick dinner, once you've mastered how to reduce cooking preparation time, your life is sorted. One of the undeniable time saving tip is using tools that make the preparation faster. It is also important that you do not end up the saved time in cleaning and maintaining the tool/appliance. We suggest simple tools that are economical, compact, easy to clean and maintain. Keep reading to understand one such tool ,the Royal Chef 4 in 1 Drum Slicer & Shredder, that we have reviewed to help you decide if its the right one for you. Operation: It is manually operated so you don?t have to depend on electricity unlike other food processors. 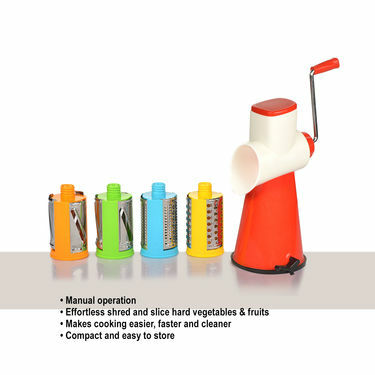 The inter-changeable and sharp blades of the drum slicer can slice and shred ingredients in a short time without hurting your hand. Body material: Made from ABS Food grade material and stainless steel, it is durable and lightweight. 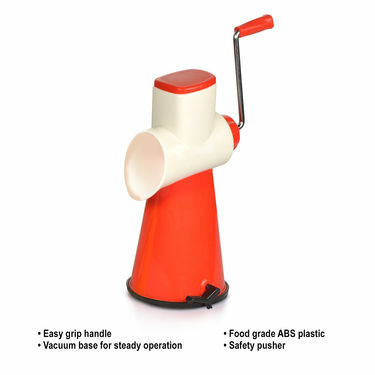 Design: With compact design, easy grip handle and suction base, the round drum slicer sits perfectly on any kitchen countertop so the food items fall out easily without any clogging. Durability: Made from high quality material it does not rust hence, keeping the product in a good condition for a long time. Maintenance:The maintenance of the product is extremely easy as the body is made of food grade ABS plastic and stainless steel. For cleaning the product, all you need to do is place the drums under running tap water and then wipe the body with a damp cloth. This is all the care that is required to keep it clean and ready to use for next time. Ideal for everyday use, this product is an ultimate addition in your kitchen and can increase your efficiency and cut down your time in the kitchen. We would highly recommend Royal Chef 4 in 1 Drum Slicer & Shredder that will shorten the cooking time from start of preparation to the serving of the meal tremendously. I purchased this product for my mother and she liked it too much. How do I become a diamond customer? 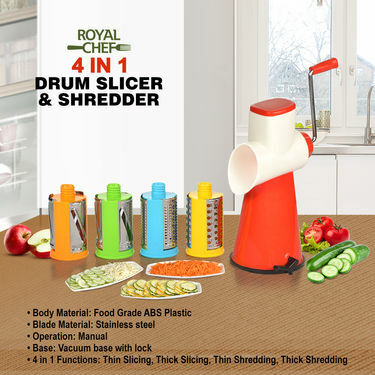 Royal Chef 4 in 1 Drum Slicer & S..VSRoyal Chef Juicer - Buy 1 Get 1 F.. Royal Chef 4 in 1 Drum Slicer & S.. VS Royal Chef Juicer - Buy 1 Get 1 F..
Royal Chef 4 in 1 Drum Slicer & S..VSRoyal Chef Juicer + 4 in 1 Drum S.. Royal Chef 4 in 1 Drum Slicer & S.. VS Royal Chef Juicer + 4 in 1 Drum S..
Royal Chef 4 in 1 Drum Slicer & S..VSJuicer & Slicer Combo + 6 Glasses.. Royal Chef 4 in 1 Drum Slicer & S.. VS Juicer & Slicer Combo + 6 Glasses..